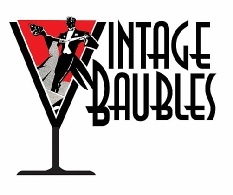 Quality vintage handbags and purses for special occasions and for everyday wear. Timeless classics for today & tomorrow. Our motto: Never leave the house without a vintage bag! We have a passion for them, and have many, many more to bring you–this is just a small sampling! Ca. 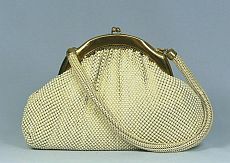 very late 30s/very early 40's Whiting & Davis bag is made from Beadlite, an enameled metal mesh domed in the center of each tile to mimic the appearance of individual beads. Mesh is cream, not white. Goldtone frame with kisslock clasp, tubular snake-chain handle, and rayon taffeta lining. Inside the small slip pocket is a coin purse--unusual to find this type of bag with its change purse. We’re not 100% certain this is original to the bag, but it goes with it. 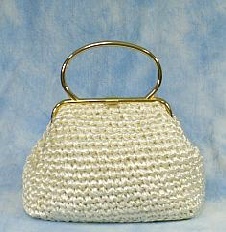 This handbag would make a great wedding bag to go with an ivory or off-white gown. Small, but holds the essentials. Size: About 6" high x 7 3/4" across. Soft sided for some expansion. Handle drop about 5 1/4". Condition: Very good verall, structurally exceptional. No loose or missing tiles, but there is some age discoloration in some areas--typical with these bags and not blatantly noticeable. Lining has some typical discoloration as well. Coin purse excellent to near mint. Lovely rayon faille bag from L & M , made in USA. Late 40’s styling, but its superb condition indicates it might date into the early 50s. Body is gathered and pleated below the rigid frame for a pouch/slouch look, but has a stiffened bottom. Lining is soft black satin, with zippered pocket, in pristine condition. Some photos have been lightened to show detail. The real stars of this bag are its unique handle and its clasp. Handle is a rigid goldtone-metal frame set on thick, fixed rings atop the frame. A strip of the faille fabric is set into it. I personally have never seen a handle quite like this. The round, tall clasp features a beautiful glass, faux carnelian cabochon. 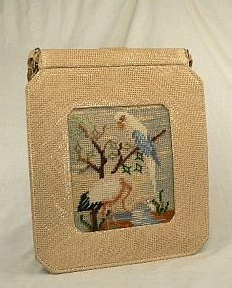 I just love the clasps on vintage bags, don’t you? Size: Large but sophisticated, measures approx. 8½″ H x 12″ W x 3″ D; 4″ handle drop. Condition: Excellent to near-mint. Even though the logo imprint on the lining is faded, bag appears to either have been used very little or cared for well. Unusual novelty bag from K & G Charlet, made in Japan. Perfect for a vacation trip or patio party. Features an embroidered panel with a parrot in a tree overlooking a flamingo in the water, both of whom have large (about 5 mm) , bright rhinestone eyes. Panel is recessed into the front, so that a dimensional picture frame is created—artwork on your bag! It’s made of a woven canvas or burlap-type fabric, which is underlayed with a metallic silver material like mylar (can't get a good enough look to tell exactly what it is). Interior is of beautiful ivory moire' satin and has one open, pleated pocket. Double handle, snap-tab closure, pleated sides. Size: A tall, thin bag, measures approx. 11½″ H x 9½″ W x 2″D (front to back at bottom). Handles drop 7 ″ to top of bag. Condition:Excellent overall condition. Only issue is that the panel background is missing some threads. Since these are not woven into the purse, but run across the surface of the panel, they could likely be replaced with matching thread. The embroidered images themselves are totally intact, with no loose or missing threads. Prong-set rhinestones are securely attached and in excellent condition. Interior is clean. 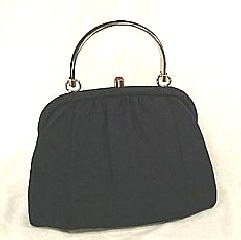 This early 40's Whiting & Davis bag is made of the firm's patented Alumesh, which was brought to market in the late 30s. This style has been one of W & D's most popular, as it appears to have been made right up until the 60s. This is definitely one of the older ones, however, based on the tag, construction, and lining. Mesh is light cream or eggshell, not snow white. 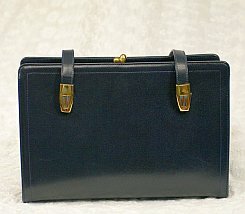 Interior is deep navy blue faille with one open slip pocket. Zipper top with small pull chain. Appears not to have been used much. Size: A nice size at 11 1/2" across widest part and 8" high. Soft sided, will expand in width. Handle drop is 6 1/4". Condition: Excellent structural condition--no missing, loose, or damaged beads; zipper works perfectly. Minimal enamel loss on a few of the body beads. The handles where you hold them show some color loss at the bottom; not very noticeable. Interior is pristine. Wonderfully whimsical bag is from maker Lumured and made in the U.S.A., ca. late 1950s/early 1960s. These Lumured caviar-beaded bags were made in many different styles and are great for spring and summer. 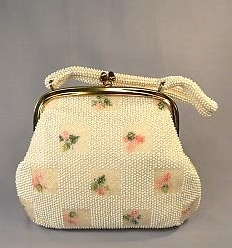 This is fashioned of tiny white plastic beads overall, including the handle; body is accented with clear-beaded squares embroidered with a sweet pink & green floral pattern. Lined in silky faille fabric with two small slip pockets that are edged in gold piping. Size: A very nice size, at approx. 8 1/2" high (not including clasp) x 9 1/4" wide; 5 3/4" drop from handle top to frame. Condition: Near-mint, possibly unused. I see no flaws or signs of wear. Goldtone frame and kiss lock are bright, no finish loss. Pristine interior. Based on weight and destination, calculated at checkout. This ca. early 70's bag was made in Japan by Jana, which also made Pucci purses and bags. Though not as flashy as the Pucci styles, the Jana-only labeled bags are widely recognized as being of very high quality and are very sought after in the vintage world. And harder to find than those of many other makers. 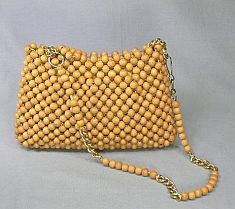 This wood-bead purse exhibits the hippie/boho influence of its day, but isn’t over the top. It’s classic enough for everyday use—a perfect summer bag! Its handle of wood beads and chain sections is convertible from shoulder strap to hand strap, making it even more versatile. On either side, there’s a dimensional-effect bead pattern at the top. Has zip-close top with bead-loop pull, jute lining with pleated pocket. Size: Measures approx. 6 1/2" H x 10" L. Drop on shoulder strap is about 13 1/2 ". Condition: Excellent; no missing, loose, or damaged beads. Very clean interior. Jolles Originals was famous for its beaded handbags, many of which were quite large and whimsical—beautiful, but not something one would generally carry very often. This darling clutch, ca. 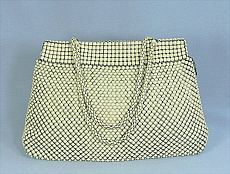 early 1960s, is the perfect size and design to carry to dinner, luncheons, parties, or on the boardwalk. 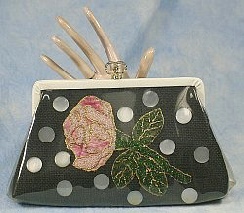 Made of black woven straw or raffia, it features a beaded rose with leaves and stems, button-like disks with mother-of-pearl finish, clear vinyl outer covering, and vinyl-covered lining. Has one good-sized inner slip pocket, which contains the original small vanity mirror. The ornate double-ring clasp has a large champagne rhinestone at the center. Size: 6" high (not incl. clasp) x 10" across widest point. Condition: Very good, with the only flaw of note being that a very few of the metallic beads on the leaves have fallen to the bottom of the bag. This isn’t noticeable at all unless you look for them on the bottom. Both exterior and interior are very clean, and bag is ready to use out of the package! Shipping Based on weight and destination, calculated at checkout. “It’s in The Bag”! When the label carries this slogan, you can be sure you’re getting a great vintage handbag from Ritter Inc. This one was woven in Italy from lustrous raffia straw in a rich créme fraiche color. Lined in tan suede, it has a large center compartment and a nice-sized interior slip pocket. Fabulous Italian workmanship, with grosgrain ribbon trim at the top to help bag keep its shape (like the petersham in a hat) and which is handstitched to the frame. And, speaking of the frame, it makes this bag a standout! Bright goldtone hinged frame features a large fold-over type clasp and rigid double handles in a sleek oval shape. Striking looks and comfortable in your hand. This is a great summer bag! Size: Measures approx. 8 1/2″ high to frame, 12″ to handle (3 1/2″ handle drop) x 12 1/2″ wide x 4 1/4″ front to back at bottom. Condition: Near mint; I see no broken raffia, and only the most minute signs of wear to the frame. Interior is in fabulous condition. Note: While not particularly heavy, this is large and requires shipping, carefully packaged, in a large box, so shipping is somewhat expensive. This exquisite-quality bag is made by Koret, maker of some of the best vintage bags ever! If t his bag were a new, contemporary piece, it would cost $150 or more. The leather and construction are of better quality than many high-end designer bags I’ve handled. With this bag’s timeless styling and on-trend two-tone hardware, it’ll look as fashionable on your arm today as it did on its original owner’s in the mid to late 1960s. This is a very deep navy blue (shown in one of the photos with black gloves for contrast), genuine leather with a striking cherry-red interior. The double handles are attached to the bag with hinged metal fittings (silver-tone base with gold-tone frames). The red center compartment has an open slip pocket and a zippered pocket. It has a kiss-lock clasp and is flanked on either side by narrower compartments. Four small feet protect the bottom. There’s plenty of room for a typical day’s needs, including your smartphone. Perfect for work or out to lunch or dinner. Size: A roomy 7½″ H x 11″ W x 3½″ D (front to back at bottom). Handles drop 8¼″ to top of bag. Condition: Near mint, one of the finest bags I’ve ever had in 30 years of collecting. About as much like new as you can get without it being new. There are some typical creases/surface marks in the leather, inherent in real leather. The only sign of use is a wee bit of wear to the clasp.